For my challenge I did set myself a couple of rules. One of those rules was that audiobooks were acceptable as long as they were unabridged, not dramatisations and lasted longer than two hours. Audiobooks fit well into my life where I have a long commutes and it allows me to catch up on my reading whilst winding down after work. Dr No is the first audiobook I have finished on my challenge so far. 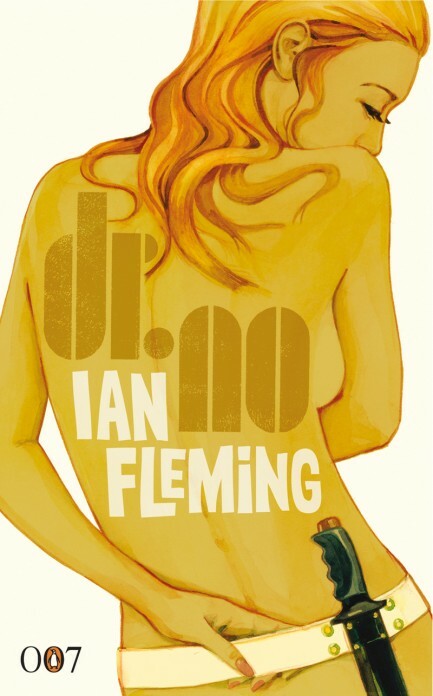 Dr No by Ian Fleming is well known. The film featuring Sean Connery is critically acclaimed and the 007 franchise is known around the world. I personally have never seen the film but fully intend to after listening to this amazing book! Bond is sent to Jamaica on a routine enquiry about two missing agents. M has given Bond this assignment to ease him back in after the disastrous ending to his last assignment. However, far from being the easy holiday in the sun M had intended, Bond finds himself caught up in the sinister plots of the half Chinese, half German mad man known as Dr No and his plans on the remote island of Crab Key. This book contains everything you would expect from a Bond novel. There is action, cunning, courage and espionage by the bucket. Of course Bond finds time to have a little tipple and manages to end up in the company of a very attractive young lady called Honeychile. It is an exhilarating adventure. Bond meets a variety of interesting characters from the Jamaican Quarrel to the very British colonial secretary and the eponymous antagonist, Dr No himself. Unlike the Bond from the films who occasionally comes across as cold and uncaring, you are privy to Bond thoughts and feelings in the novel. You realise that whilst he may have the license to kill, that doesn’t necessarily mean to say he likes to. You feel the emotions Bond goes through: guilt, anger, lust, courage, fear. This adds huge depth to the story and has empathising with Bond and wanting him to succeed and survive. The audiobook I listened to was read by Hugh Quarshie and he managed to voice the characters and the story perfectly. There wasn’t a moment I wasn’t hooked and attentive to what was being read to me. I found myself being almost disappointed when I reached home and had to stop listening. I recommend the audiobook as much as I recommend the book itself. This is best book I’ve read on my challenge so far. It kept me wanting more, had infinite variety and interest. You are kept captive by the brilliant plot and characters from the first few lines to the last words uttered by Honeychile at the end. By not reading this book you are missing out on an incredible experience. I recommend this book wholeheartedly: buy it, read it, love it! Before Mort I had never read any of Terry Pratchett’s work. I had perused some of the blurbs of his novels over the years and watched my best friend hungrily digest his works when I was at school but had never felt the desire to pick one up before. Then I decided to do this 52 in 52 challenge and asked for recommendations of books I hadn’t read. An old friend put forward Mort with the brief description “Death gets an apprentice”. This was an intriguing enough sentence that I actually went out and bought the book*. 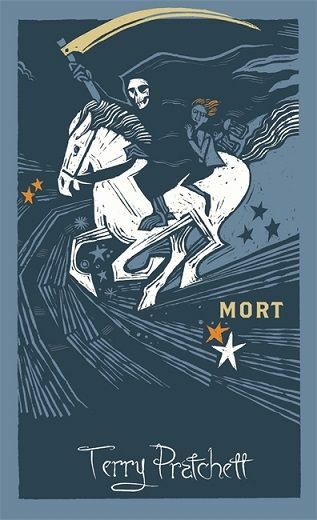 As my friend so succinctly put, Mort is a tale about the eponymous boy who becomes Death’s apprentice. Unfortunately, Mort is human and has human vices like emotions. Emotions are what get him into trouble. After being sent out on the Duty – to free the souls of the killed, Death doesn’t actually kill people himself – by himself for the first time, Mort saves the life of a beautiful princess who was meant to be killed and decides not to let his master know. Cue reality trying to tear itself apart. To make matters worse, Death, who up until this point has never had feelings, decides to try out living. Whilst Mort and Death’s daughter Ysabell try to figure out how to save the princess from being destroyed by reality trying to restore itself, Death is out dabbling with having fun, drinking alcohol and working as a chef. The plot itself is hilarious and extremely well written. It plays with irony and sarcasm mixed in with a solid storyline and engaging characters. Besides the plot there are many side notes about the Discworld – the world Mort and many other Pratchett books are set in – and parodies traits from real life and science. This adds another layer to the book as you can have a giggle about how obscure mundane and normal things from our world really are when put into a different context. I enjoyed Mort and I am looking forward to reading more of Pratchett’s work. This has been the first book so far in my challenge that has made me properly laugh and I enjoyed that. The other books I’ve read have had rather serious plot lines and it was good to read something light-hearted. I recommend Mort to those who like parodies, humour and fantasy. * Infact, I bought six Pratchett novels as they were on offer. They will form part of my 52 in 52 challenge. I have adored Sherlock Holmes since I was a child. At age eight I took a book down from my parents’ bookshelf and dusted it off. It was a blue, hard-backed novel with a sun-bleached spine. The pages of it were yellow around the edges and it had that wonderful musty smell of a book that has been well loved but forgotten about for several years. The cover was simple with only the title and author adorning the front: The Hound of the Baskervilles by Sir Arthur Conan Doyle. I cracked the book open and began reading the first page. And so my love affair with Sherlock Holmes tales began. At first I didn’t understand all the words and sometimes had to get my father to explain things to me but the stories themselves were exciting and fuelled my young imagination. I reread The Hound of the Baskervilles many times and for Christmas when I was ten years old I received the story as a cassette audio book. 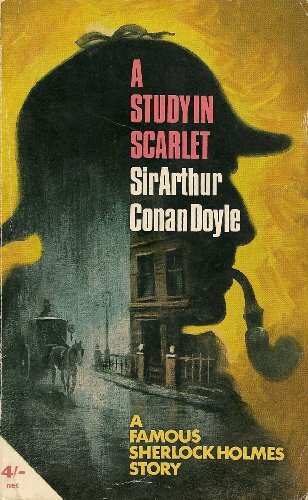 I have covered many Holmes stories since my childhood but until last week I had never read the first Sherlock Holmes novel: A Study in Scarlet. A Study in Scarlet is set out in two parts. The first is Dr Watson’s account of meeting Holmes and the first case that Watson sees Holmes work on. It is full of precise and eccentric description of the characters with excellent descriptions of Holmes and other involved in the case. Conan Doyle’s depictions of the crime scenes and the hunt for the murderer are equally as wonderful. Each word is placed carefully and plays a part in the overall solution. No detail is missed. The second half is unusual in that, for the most part, Holmes and Watson are not in it. Instead this section is an account of how the man responsible for the crimes committed in the first section of the book came to commit those crimes. It is mostly set in America and the story that unfolds slowly divulges how this man came to be a killer. It is heart-breaking tale of love, death and ultimately revenge. At the end of this section we return to London for the summing up of the case. It ends well and I didn’t feel dissatisfied at all with the outcome. Sherlock Holmes novels are special. They take you on a bewildering and well-structured journey from crime to resolution. These journeys puzzle, excite, engage and fill you with awe at the powers of Holmes’s mind. This first adventure did not disappoint and I would recommend this novel alongside any of its brothers. As the turn of the year came upon us I ventured into a bookshop in Brighton whilst waiting for the bus. I remembered that back in November I had set myself the challenge of reading 52 books in 2014, approximately one every week. Browsing the shelves I came across The No.1 Ladies Detective Agency. My mum has every book in the series and has recommended them to me several times. I left for my bus with a copy of the book swinging in the little bag hung from my wrist. 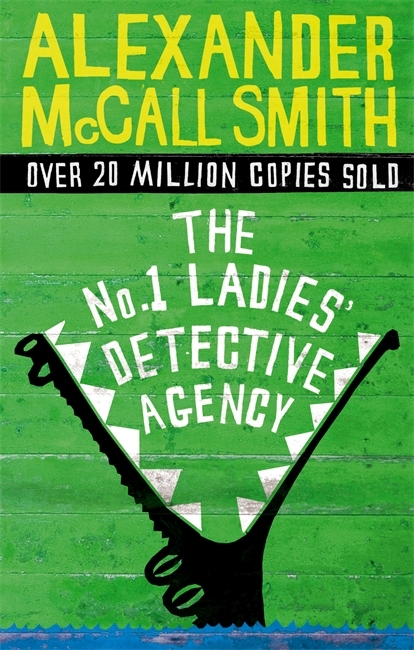 This novel by Alexander McCall Smith is the first in the No.1 Ladies Detective Agency series. It is set in Botswana and focuses on Mma Ramotswe, the proprietor of the No.1, and only, detective agency in Botswana run by a woman. Mma Ramotswe starts the business after the death of her father with the money she receives in her inheritance. The chapters occasionally feel haphazard, with the stories in them varying from short accounts of the cases Mma Ramotswe has solved, her and her father’s past and a book long case that is resolved at the end. This layout works well though and helps capture the essence of life in southern Africa and spaces out the events in the book. The descriptions of the landscapes and life where Mma Ramotswe lives and works add to the feel and depth of the story. In this review, and others, I will not delve too deeply into the plot of the book. However, I will say I enjoyed it very much. The short chapters allowed for the story to be picked up and put down easily and meant I could read it during my work break quite comfortably. The characters within are varied and interesting and from hearing the back story of Mma Ramotswe you can understand how she got to be where she is and empathise with her. I am looking forward to reading more books in the series and finding out where Mma Ramotswe goes from here on. A lovely book which captures your attention and imagination. Although it’s short, at only a couple of hundred pages, it is well worth your time to read it.